Tina Mroczkowski practices in the areas of estate planning, probate and trust administration, tax exempt organization law and corporate law. She received her undergraduate degree in Finance with Honors from the University of Illinois, her law degree with Honors from The John Marshall Law School and her LL.M. in Taxation with Honors from DePaul University School of Law. She was admitted to the Illinois State Bar in 1996, and to the Florida Bar in 2012. 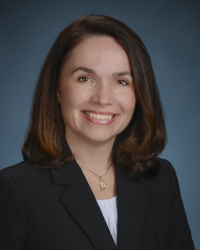 Ms. Mroczkowski serves as a Director and as the Treasurer of the Florida Association of Women Lawyers – Sarasota Chapter. She also serves as a Director for the Southwest Florida Planned Giving Council. She is a member of the Catholic Lawyers Guild, Southwest Florida Estate Planning Council, the Sarasota County Bar Association, the Florida Bar Association, the Illinois State Bar Association and American Bar Association. Ms. Mroczkowski is a member of St. Martha’s Catholic Church where she is a member of the Council of Catholic Women and her community activities include serving as a Director for Cenacle Legal Services, Art Center Sarasota and the Children’s Guardian Fund. In addition she has served as a Guardian Ad Litem for the 12th Judicial District.